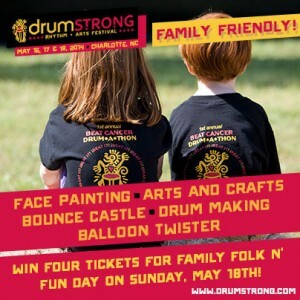 Home Directories	DRUMSTRONG family 4-pack GIVEAWAY! Smarties – we have a great family giveaway for you! Up for grabs is a family four-pack of tickets for Family Folk N’ Fun Day this Sunday May 18 at the DrumStrong Festival. The festival is a three-day rhythm and arts festival in Weddington full of activities and great music. Enjoy more than 20 great bands throughout the weekend, along with art and food vendors, a craft beer garden, yoga, KidzFun and a warm-up drum circle activity. The winners of the family 4-pack will also enjoy face painting, arts and crafts, a bounce castle, drum making and balloon twister. This is a can’t miss event! DRUMSTRONG started in 2007 and has expanded to more than 70 cities in 25 countries to help raise funds for local cancer initiatives. Come out and support this great cause and enjoy some fun music and activities! To be entered for the chance to win the family 4-pack, share this page on your Facebook wall by “liking” the post in the top left corner and leave a comment below about what you’re most looking forward to at the festival! One winner will be drawn on Thursday, May 15. Good luck! Our 2014 Smarty Mother’s Day Swag Winners – all 41 of them! I love this time of year- with all these great festivals to bring the kids to! Sounds like such a fun giveaway! Would love to try something new as a family. I love that $ goes towards cancer funds. I love that this event brings familes together to fight against cancer (which destroys so many families).